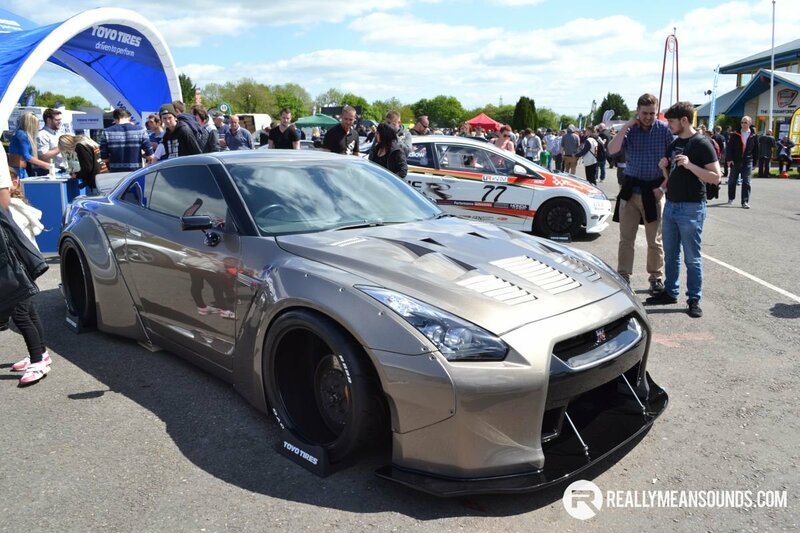 Japfest at Castle Coombe has firmly cemented it’s place as Europe’s biggest celebration of Japanese car culture. Over 3,000 cars of all eras and marques packed the length and breadth of the sun-drenched Wiltshire race circuit, whilst hordes of spectators thronged the club stands or watched the action on track from the mental time attack and drift machines. Perhaps the most fascinating thing about Japfest is the sheer variety and diversity of cars on display. In fact, the show is a perfect illustration of how interest in Japanese cars has evolved from the rally-bred Subaru Imprezas, Mitsubishi Lancer Evolutions and Celica GT-Fours of the 1990s, through drift inspired s-bodies, high-revving Hondas and onto VIP-style luxury saloons. It’s hard to define or pigeonhole Japanese automotive trends, as they cover so many differing styles – from the outrageous to the curious. In fact, if there one thing that the car makers of Japan excel at, its producing a quirky car; and there’s nothing more quirky than the chunky but funky Toyota bB. Tuning is synonymous with the Japanese car scene, with many enthusiasts modifying their car to extract as much power as possible. The more intrepid owners at Japfest could test their mettle (and metal!) on the circuit, whilst others were happy to show off their hardware by popping the bonnet. The standard of cars on display was incredibly high. Quite often, the mechanicals under the bonnet were just as shiny as the bodywork. And another thing, never underestimate a small car. Some can pack an almighty punch! It’s hard to appreciate now, but during the 1970s, British roads were dominated by “traditional” home-grown cars; Japanese manufacturers had yet to make a real breakthrough. Therefore, a UK specification Colt Gallant GTO GSR is a very rare sight indeed. Mitsubishi didn’t export the car in large numbers and when they did, they chose not to use their own brand name. This beautiful 1975 model has a 2-litre engine, which originally produced around 100bhp in factory form. Likewise, it’s not often you see more than one Nissan Silvia S15 in the same place either, due to the relative scarcity of this import-only model. The members of the S15 owners club (S15OC.com) managed to conjure up almost 20 cars for their stand, which made this one of the biggest gathering of S15 Silvias outside of Japan. The trend for massive wings has shown no sign of abating anytime soon. It remains an opinion splitting modification which can make or break a car. The attraction of the AE86 Corolla never seems to wane. If anything, as the years pass, demand for this classic machine has increased, despite the availability of more modern and more plentiful rear wheel drive alternatives. The Corolla might not have the finesse or refinement of a 350Z, but the aging chassis still provides a unique back to basics driver experience. The incredible and enduring popularity of Japfest is an strong indication of how vibrant and flourishing the Japanese car scene is. A scene which continues to encompass a broad spectrum of vehicles from kei cars and bonkers vans, right through to bona fide motorsport monsters. A great selection of stuff there. Nothing like an enormous show like this where there's always something to catch your eye. http://reallymeansounds.com/wp/wp-content/gallery/japfest15/DSC_0167.JPG I think the R32 has aged really well - wish I'd held on to my GTR. Hmm this or JAE next year. JAE is equally good in my opinion @Artoir. Perhaps even better as you can camp, etc. The live action is great at Japfest, but JAE is a more laid back social vibe. @chrisd1 was that a club stand? It's great set up at Castle Coombe. I was there the year the guy managed to roll the NSX on a parade lap.